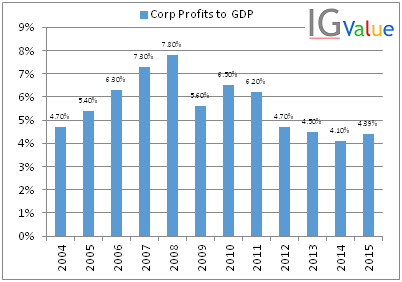 "In my opinion, you have to be wildly optimistic to believe that corporate profits as a percent of GDP can, for any sustained period, hold much above 6%. One thing keeping the percentage down will be competition, which is alive and well. In addition, there's a public-policy point: If corporate investors, in aggregate, are going to eat an ever-growing portion of the American economic pie, some other group will have to settle for a smaller portion. That would justifiably raise political problems—and in my view a major reslicing of the pie just isn't going to happen." While doing some research for a completely orthogonal topic to this one, I found a Buffett saying similar to the one above. That got me thinking about why Buffett says the magical 6% number. Putting that 6% number together with his quote on total market cap to GDP being under 1x we can conclude that he believes the maximum price to earnings for all companies should be 1/6% or 16.67. The average P/E over the last 16 years of the NIFTY in India is 18.48 which is consistent with this notion as well. Willingness to pay for a brand is something that has to be measured in the marketplace. If you are looking at something like Tide from P&G and see a generic washing powder you could see the reaction of people who may or may not pay up for the brand. Another way to check this is to compare the margins of the company in question with competition and with generic manufacturers of the same thing. Ajanta pharma is a generic branded formulations manufacturer whose margins are more than the non-branded generic manufacturers. Low rate of change is a confusion concept and it took me a while to understand this. The “low” part of this statement is very relative and is highly interlinked with your circle of competence. In general businesses like Coke are the lowest rate of change. The product of coke has been constant for over half a century and people are willing to pay up for it. In terms of rapid change you can see semiconductor companies. Now Intel could be a business that people find a great moat in but the rate of change is very high. As per popular demand I will get back to the getting conviction: Fundamental factors - points to watch out for later. Lets cover another very interesting topic for now. How do you find the right discount rate? How do you find the right growth rate? In addition you will never find a hindustan lever or a dabur or a Britannia trading in single digit P/E multiples - despite the mood swings of Mr. Market. Does that mean the intelligent investor never buys into these wonderful companies? 8. Cash flow quantity – If the cash flow from operation is on an average lower than net income it should be a huge warning sign that earnings are overstated. In some cases even when cash flow from operations is good some expense items may have been capitalized by classifying them as cash flow from investing. Now the best way to judge this is to see the delta revenue, Net income and cash flow from operations that that investing has created. Studying the cash flow from investing is also a good practice to understand the expensing and capitalization practices. 6. Options dilution - Many companies give stock options to management in order to motivate them to perform better. Companies with too many stock options typically are not great to invest in – in my experience. A small amount of stock options can be a good tool although I must say no options is better than some options. In the previous post we learned the board metrics to judge the fundamentals and a couple of things to watch out for. Unfortunately there are several other things to watch out for. 3. Expensing or capitalizing grey area items – for example some companies may capitalize and show as cash flow from operations their research and development costs. What needs to be determined is that whether the item capitalized actually has long term value. You also need to study how previously capitalized grey area items are depreciated. Envy is an emotion triggered in a person when she or he thinks that another has something better. Envy can cause a series of wrong decisions and make investors do things that are completely irrational. During the pre Y2K dot com boom several investors made lots of money on technology stocks. Companies with very large negative margins were valued at billions of dollars. It was said that a man with an idea could be funded with millions. At this point Buffett clearly said that he did not understand technology and thus wanted to stay away from it. It was probably Buffett’s control on his envy that enabled him to stay away from this potentially disastrous trade. During the ensuing dot com bust he got several opportunities to buy lots of cheap high quality moat businesses. I would be obliged if you could tell me whether you like the content in the Feedly format and if you could compare the content to the flipboard format mentioned in the IGValue Flipboard Magazine article. The most common form of this bias is where an investor feels “I have bought 2 stocks and both have gone up by 20%. I told my friends and everyone says I am a good stock picker”. This as you all probably already know is not true. Many a time people look to other people to see what they are doing. Yes this is also called cloning – but blind cloning is also dangerous. You should definitely look at what other successful investors are doing but should understand the investment thesis before taking the plunge. All decisions of any legendary investor are not correct – even Berkshire makes mistakes and Warren Buffett is the first one to report all on each annual report. Why does very high IQ not give you an edge in investing? In the hedge fund world you find fund manager after fund manager pitching the smartness of their investment team to the investors. Some will only hire out of the Ivy leagues. Some will have an interview process that could match that of the most competitive companies in the world like Google or Facebook or General Electric. The results, however, don’t seem to correlate with IQ. Take the example of Long Term Capital management (LTCM). It was led by John Meriwether and had Myron Scholes and Robert Merton on the board who shared a Nobel prize! Pavlov was a Russian physiologist who conducted an experiment where he sounded a bell at the time a dog ate food. Over time just the sound of the bell caused the dog to salivate. This type of conditioning is called the Pavlovian association bias and can be lethal in investing. This is the bias running in the background that sometimes drives customers to buy the higher value item linking expensive=better quality. The automotive industry has this syndrome played out in wonderful detail. BMW has created a brand for itself where car buyers believe that its quality is better. Several studies have shown that car makers like Honda and Toyota have similar or sometimes even better quality, provide the same features but still consumers continue to buy BMW and it remains one of the most profitable car companies around. Cars like the Rolls Royce or the Bentley have often been proven of poorer quality than several cheaper cars but they continue to sell because of the Pavlovian association bias. How can consistency & commitment be bad for the investor? Consistency and commitment are supposed to be virtues in society. When you take a stance after researching it thoroughly it becomes very difficult for you to see the other side of the picture. This is also stated as resistance to change in management folklore. When the added pressure of public disclosure of the stance is present very few people have the capability to change the stance.